Lexi, Nitro, Tallulah, Bailey, and I are excited to participate in this weeks Saturday Pet Blogger Hop. Special thanks goes out to our Pet Blog Hop hosts, Life With Dogs, Two Little Cavaliers, and Confessions of the Plume! 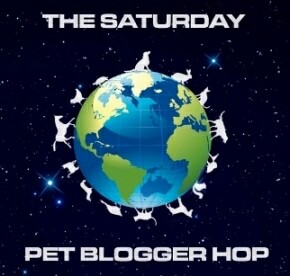 If you would like to read some entertaining pet blogger posts in the Saturday Pet Blogger Hop, just click on one of the host links above or click on the purple Pet Blogger Hop button on the right side of our homepage. Happy Pet Blog Hopping! This week was our 15th Wedding Anniversary and my sweet husband Chris decided to surprise me with a new Nikon Coolpix P500 camera. I photograph so many dog events and he always sees me laying on the ground trying to get ground level shots. But now that I have this new camera, I won't be on the gound so much anymore. The P500 also has a crazy zoom lens (36X) and the greatest feature on this camera is the pop out adjustable screen so I can lower the camera to the ground, pop the sceen out, point the screen up towards the sky to see what I am shooting, and then click and shoot (without crawling on the ground anymore). The P500 also shoots HD video and functions really well in low light which is exactly what I need. The person who designed this camera is brilliant! My deaf white Boxer Nitro and I decided to go to the Salem Farmer's Market today and try out our new camera. The following photos were taken with my new Nikon Coolpix P500. I popped the screen out and took the following photos just sitting on the bench at the Salem Farmer's Market. We were also sitting in the shade so you can see for yourself this camera does a very good job shooting in low light. I took these photos while I was just sitting on the bench and Nitro was laying under the bench. The new flip out screen allowed me to take a photo by just sitting on the bench, holding the camera low and flipping out the screen so I could see Nitro under the bench. The flip out screen is such a cool feature! Downtown Salem getting ready to celebrate the 4th of July. Nitro loves kids so much that he has a certain gift he has fine tuned to reel them in. The gift or "hook" Nitro uses whenever he sees a small child he wants to meet is he will lay down flat with his head to the ground (dog rule # 1, head down, eyes up) and he will look up with big sad eyes until the child in question has been lured directly to him. In this case the little girl in the photo is Maddie and Nitro easily lured her to him with just a sad glance in her direction. He is really taking advantage of this new found natural talent. Then before you know it BAM! The Nitro wet slobbery kiss is laid on Maddie's face! Nitro wants to make sure Maddie doesn't leave so he lays down on his side and gives her googly eyes...Maddie also showed us how she knew all of her ASL signs (very impressive). Nitro is in pure heaven! Oh my...then he goes in for more Nitro slobbery kisses! Look at Maddie's sweet little face she is having such a ball with Nitro. Below are some more photos I took this afternoon with the Nikon Coolpix P500. I love this camera! Nitro was totally pooped out from going into town so he was napping on the couch. Normally I would have to lay on the floor to get this perspective but not with my new camera. I just flipped the screen out and started shooting. I think these photos turned out well don't you? Look at that big smooshy face! Some floor shots with the new camera. I took these shots in the sunshine this morning. Nitro loves to lay on the hot tub cover because it is warm. Okay. Now I not only want your camera, but Nitro too! Boy is he a charmer! The smile on Maddie's face said it all. Nitro is looking quite well and he obviously loves his new home and parents. The shots were amazing. So impressed that your husband was thoughtful enough to get you a camera like that. Wow! Great pictures of dog and child! Hu-mom really needs a new camera and has put that one on the top of her list. Hey Nitro! I gotz lips jus like yers! Wow, Nitro! You sure are a charmer! I bet ALL the girls fall for you. These photos are fantastic! (Of course you're working with wonderful subjects!) I am in the look-out for a new camera and am going to check out this one for sure. Looking forward to meeting you at Blogpaws in August. Hope you can make it! LimeVPN offers unmatched Buy VPN Service speed at $2.99 per month only. New River Valley Fair Is Here! Horse and Hound Wine Festival Is This Weekend! Welcome To Special Effects Sunday!